Martin Odegaard will overcome his initial problems and be a Real Madrid success, says former boss Ronny Deila. And Spanish newspaper AS refused to give him a rating for his weekend display before he was taken off after 65 minutes in a 1-1 draw with Tudelano. The midfielder, who has already won four senior caps for his country, had only just returned to the side after being dropped by coach Zinedine Zidane after Castilla slumped from first to seventh in the league following four consecutive defeats. "He has been there for two or three months and it's quite early to talk about a 16-year-old boy and if it's good thing or a bad thing that he's gone to Real Madrid," said Deila. 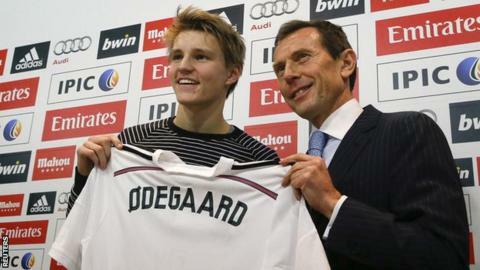 The Celtic boss had tried to persuade Odegaard to join him at the Scottish champions after his own summer switch from Stromsgodset. "He needs time to adapt, learn the language, get into the club situation," he added. "Just to go to Real Madrid, everything is new. "I saw him in the national team when they were training and he looks very well."